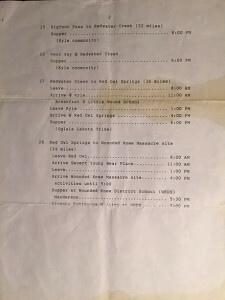 The images you see below are of actual documents and fliers from the memorial ride in 1990, 25yrs ago. Spiritual interpreters, men of great knowledge and wisdom, prophesied that in this generation, the Sacred Hoop will be mended, the nation will begin a new era. Remember Wounded Knee of 1980; remember your relatives, your grandchildren, and remember that when the eighth star appears, the end is near. 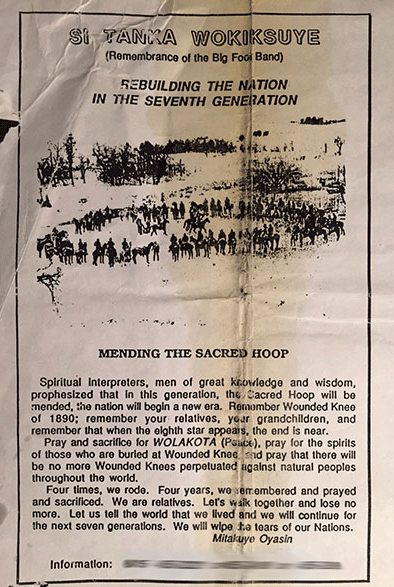 Pray and sacrifice for WOLAKOTA (Peace), pray for the spirits of those who are buried at Wounded Knee and pray that there will be no more Wounded Knees perpetuated against natural peoples throughout the world. 100 years ago, Mniconju Lakota Chief Big Foot and his band of 400 people were massacred while under a white flag of truce at Wounded Knee Creek in the Pine Ridge Reservation. They were massacred by an avenging U.S. Army 7th Cavalry, Yellow Hair Custer’s old command. 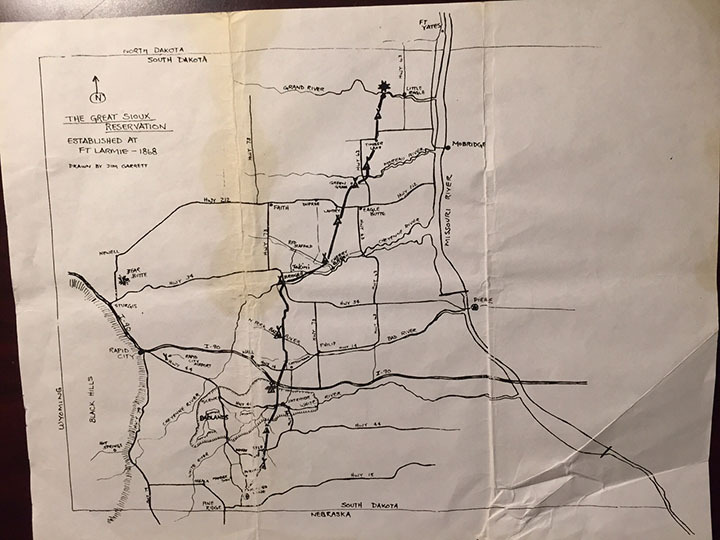 14 years before this, the 7th Cavalry was wipe out by the combined forces of the Lakota along the banks of the Little Big Horn River. 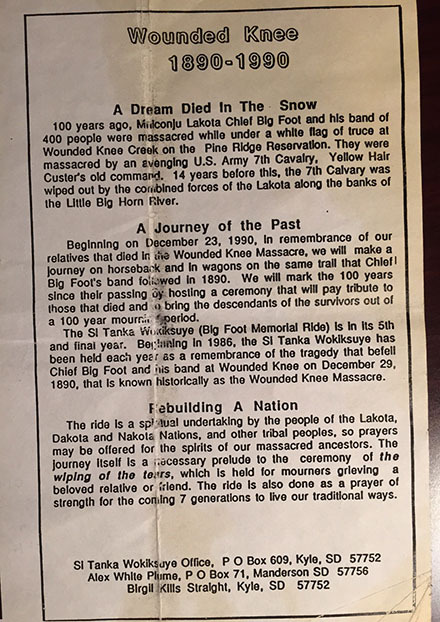 Beginning on December 23, 1990, In remembrance of our relatives that died in the Wounded Knee Massacre, we will make a journey on horseback and in wagons on the same trail that Chief Big Foot’s band followed in 1890. We will mark the 100 years since the passing by hosting a ceremony that will pay tribute to those that died and to bring the descendants of the survivors out of a 100 year mourning period. The Si Tanka Wokiksuye (Big Foot Memorial Ride) is in its 5th and final year. 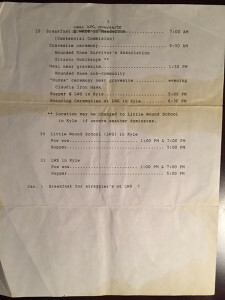 Beginning in 1986, The Si Tanka Wokiksuye has been held each year as a remembrance of the tragedy that befell Chief Big Foot and his band in Wounded Knee on December 29, 1890, that is known historically as the Wounded Knee Massacre. The ride is spiritual undertaking by the people of Lakota, Dakota and Nakota Nations, and other tribal peoples, so prayers may be offered for the spirits of our massacred ancestors. The journey itself is a necessary prelude to the ceremony of the wiping of the tears, which is held for mourners grieving a beloved relative of friend. The ride is also done as a prayer of strength for the coming 7 generations to love our traditional ways. 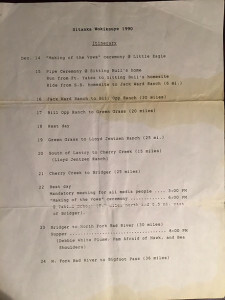 Jan 1 Breakfast for straggler’s at LWS ?